Fiocco is a white marble side table, an accessory for sophisticated living rooms. The golden metal structure adds a shiny touch that, together with the Carrara marble, enhance any room decor. Fiocco is a small luxury side table perfect to complement a sofa, chaise longue or armchair. 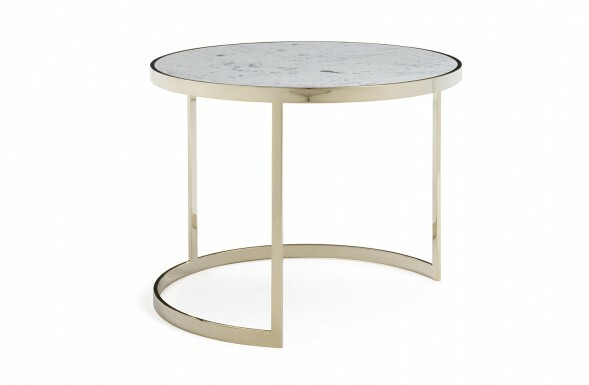 It features an elegant polished metal structure with gold finish and Carrara white marble top. Simple in design yet sophisticated, Fiocco is a round side table for the living room. The entire structure is finished in a beautiful gold tone adorned with brown leather and topped with Carrara marble. Add a dash of art deco glam with this polished brass and white marble side table, with sculptural metal base and smooth Carrara marble top. A true jewel piece for elegant living rooms. Demonstrating an antique inspired design, this gold metal side table is masterfully crafted with a structure topped with a pure white marble slab. The frame is adorned with beige leather strips. Fiocco is a round small table handcrafted by skilled artisans based in Milan. The golden metal structure is complemented with a marble slab for holding a designer lamp, family portraits and accent objects. 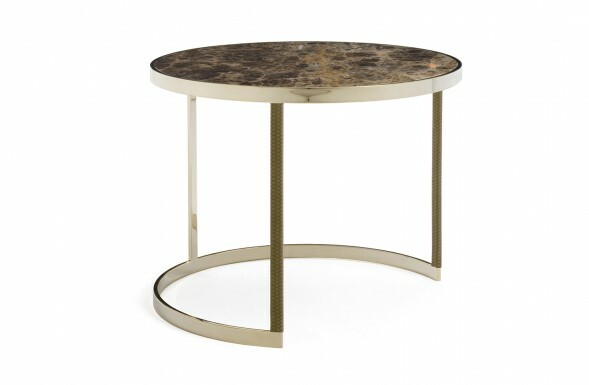 Fiocco is a small round metal coffee table in an elegant gold finish, topped with a Dark Emperador marble slab. A luxury accessory of timeless charm, this small accent table adapts to any living room. Fiocco is a round brown marble side table with luxurious finishes, ideal for classic or modern living areas. It offers a timelessly appealing line thanks to golden structure and Dark Emperador marble top. Fiocco is a small metal side table with brown marble top in round shape, structure in elegant golden finish with deep green leather inserts. A refined complement inspired by art deco furniture. Fiocco is a bespoke marble coffee table with an eye catching surface in Dark Emperador, a stone with unique characteristics and stunning colouring. The structure is made of metal in gold finish and leather. Fiocco and Granfiocco are design side tables in Carrara marble with elegant structure in gilded metal. The set of two round small tables is the ideal choice to complement the sofa side area. Fiocco and Granfiocco is a set of two marble side tables with gold frame, blue leather inserts and Carrara white marble tops. The two pieces can be used separately, side by side or in a nesting design. Set of two round side tables in luxury marble Carrara, with a bright golden metal structure and applications in brown woven leather, Fiocco and Granfiocco are precious complements for a refined living room. Fiocco & Granfiocco is a set of two metal side tables with a white marble top. An elegant solution for a luxury living room, they can be used separately or overlapped for a refined composition. 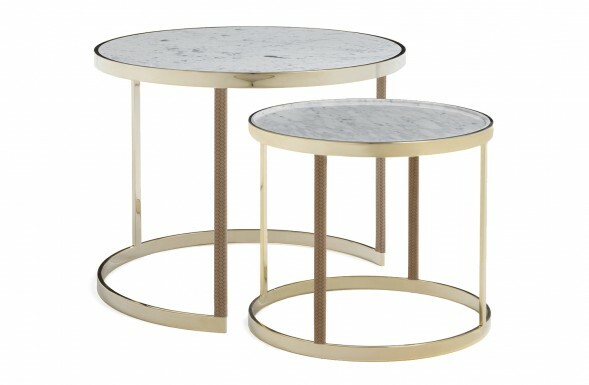 The set Fiocco & Granfiocco offers two modular round side tables, with a shiny gilded metal structure topped by a precious Carrara marble slab. Marble and gold provide the perfect glam combination. Fiocco and Granfiocco are round design side tables with shiny gilded metal frame and Dark Emperador marble top. An elegant set of two stackable small tables, for classic and modern living rooms. Practical and elegant, Fiocco and Granfiocco is a set of two marble stacking side tables. Both feature round tops in Dark Emperador marble and have a refined structure in shiny golden metal. Fiocco and Granfiocco is a 2 piece nesting tables set characterized by luxury materials and finishes. The metal structure is polished gold, while the tops are two slabs of Dark Emperador round marble. Fiocco and Granfiocco are two nesting side tables for luxury interiors. Golden metal structure with inserts in green leather and Dark Emperador marble top, give these precious accessories an extremely refined look. Fiocco and Granfiocco are two round nesting tables to be placed side by side with a sofa, armchair or chaise longue. Structure in golden metal and tops in Dark Emperador brown marble. Fiocco and Granfiocco is a set of two side tables with marble top and gilded metal base. The set is perfect to optimize the space, providing enough space to keep everything you need at your fingertips. 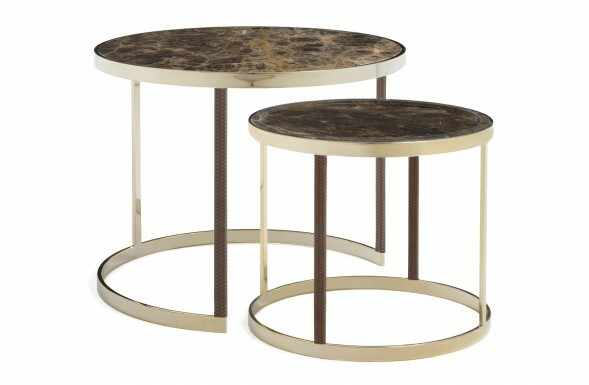 Fiocco and Granfiocco is a stackable side table set with round marble top and metal structure in an elegant polished gold finish. Luxury accessories refined living rooms or design hotels. The 2 piece nesting table set Fiocco and Granfiocco adds a dash of art deco style to any room. The minimalist metal structure is enhanced by the golden finish and topped with a round marble slab. The nesting round marble end tables Fiocco and Granfiocco feature a gold metal structure with green leather inserts and Roma Imperiale marble tops. The perfect accent pieces for sophisticated living rooms. Granfiocco and Fiocco is a high end marble nested table set of 2. With round tops in Imperial Rome marble, they offer a refined solution for classy living rooms. to be placed on the sofa side. Bring a dash of sleek design to your home with a decorative round side table. Inspired by art deco style, Fiocco has a metallic structure with golden mirror-like finish, topped with a striking marble slab. The Fiocco round cocktail side table is a clean-lined complement with metal base in glossy gold finish that makes the side table to stand out. The tabletop is made with a slab of Roma Imperiale marble. 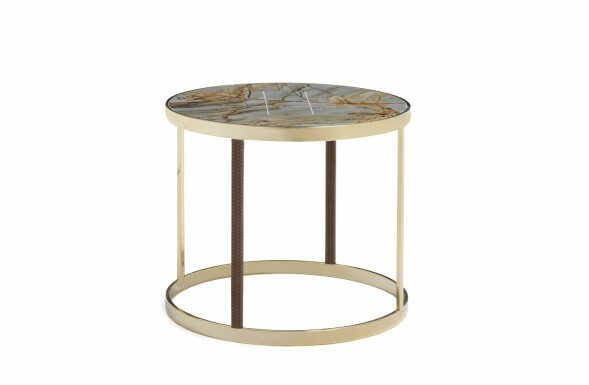 Fiocco is a handcrafted side table with tubular metal base with polished gold finish topped with a stunning Roma Imperiale round marble slab. Ideal as a sofa-side accessory or next to an elegant reading armchair. Made in Italy gold side table, Fiocco is a luxury accessory. The structure in gilded metal is embellished with applications in green Military leather and houses a round top in Roma Imperiale marble. Fiocco is a luxury made in Italy marble side table with shiny gold metal structure and tabletop in Roma Imperiale marble. Perfect sofa side piece, it can be combined with armchairs and chaise longues. Granfiocco pairs the simplicity of a round tabletop with a minimalist metal frame in gold finish. This refined round marble side table works one of the most powerful colour combinations. 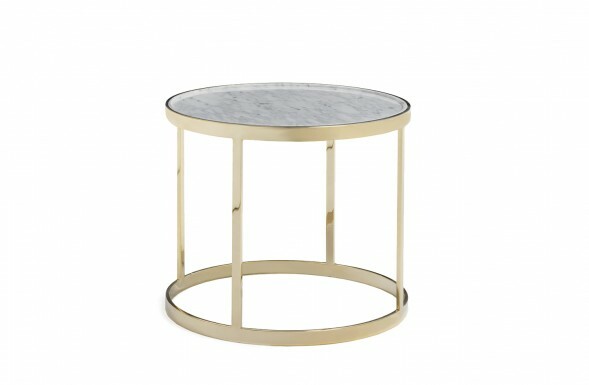 Add a stylish finishing touch to your living room with this modern round side table, with golden metal structure and Carrara marble top. The half moon shaped base allows for nesting designs. Granfiocco is a marble sofa-end table with a resistant metal structure in a fancy gold finish and a round top in Carrara white marble. The perfect solution for a modern living room or a classic space. Add an elegant finishing touch to your living room with this marble top accent table with round design and gold structure. The hollow base is shaped to nest a second small table underneath. Granfiocco is a gold sofa end table handcrafted in Italy. Its structure is coated in a luxurious golden finish which is topped with a perfect circle of pure white Carrara marble. Granfiocco is a round metal side table that showcases a simple silhouette in beautiful finishes. An eye catching piece with polished gold palette and elegant brown marble tabletop. Granfiocco is a luxury sofa end table with metallic golden structure polished down to a mirror-like finish and a round tabletop made with Dark Emperador brown marble. Granfiocco is a metal accent table with a timeless design. The metallic frame features brown woven leather inserts, a beautiful golden finish and a Dark Emperador brown marble top. Granfiocco is an accent round table with Dark Emperador marble tabletop and golden metal frame with green leather strips. The hollow design allows for creating combinations with a second side table. 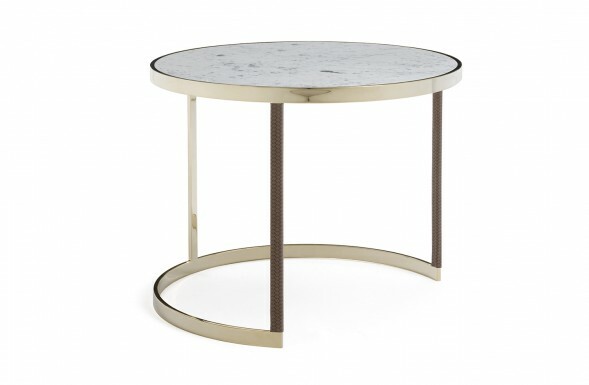 This high end marble side table delivers a stylish silhouette in beautiful finishes. The structure is a metallic frame polished and coated in gold, with beige woven leather strips to adorn two of the legs. A must-have for any fan of art deco style, Granfiocco is a round gold side table made from polished metal with a shiny finish. The top is made with a luxe variety of marble called Roma Imperiale. This high end round side table infuses any room with sophistication thanks to its shiny gold frame and marble tabletop. The structure is made polished metal decorated with leather strips. 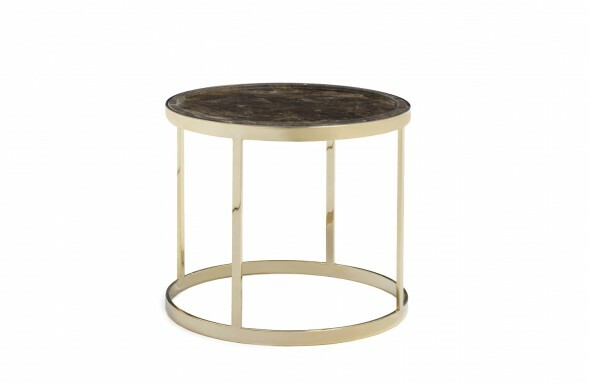 This round occasional table is a luxury accessory for modern and classic living rooms. It takes inspiration from art deco pieces with its golden frame and marble top. An eye catching gold and marble accent table with a metallic base adorned with green leather strips and topped by a Roma Imperiale marble round slab. 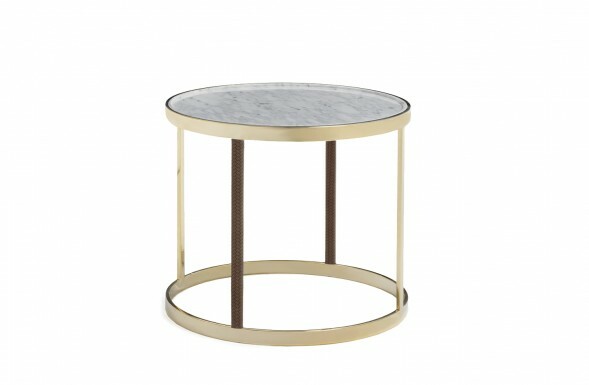 A gold and marble accent table made to stand out. Granfiocco is an Italian side table designed to enhance your living room. The piece is made with hand-welded metal frame topped with a precious Roma Imperiale marble round slab.